It's not uncommon for those outside the United States to have a fondness or interest in the American West of the late 19th century. After all Americans have been glamorizing the era for better than a century, from books to music to film, from Billy the Kid to Wyatt Earp to Custer's Last Stand. It's a fascinating period, but heavily mythologized from extravagant, often spurious, details. 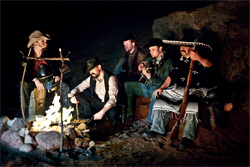 Boothill Regulators: soon to repeat the famous Blazing Saddles campfire scene? 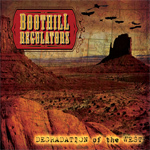 Here's Sweden's Boothill Regulators, with their fascination with the American west displayed on their debut album Degradation of the West. First, for some history, 'Boot Hill' is a common name for a graveyard of the period, the first being found in Dodge City, Kansas. The 'regulators' likely refers to the posse formed during the Lincoln County War (1878), which famously has Billy the Kid as a leader. It has come to be the name of a person or group used as a hired 'gun,' deputized or not, to 'regulate' or keep things in order for his employer. The Boothill Regulators, then, simply apply the Western (not country) music style to hard rock with lyrics conveying the same themes. And they're pretty good at. They have chaps and leather twang effortlessly blended with some hard rock groove. You can hear it in most every song, yet it's more prominent in some. Devil's Blood, List of Names, Black Label, or Song of Dale are good examples. Sometimes the tunes get harder, edging towards metal, as on Sad Medicine or We Ride. Here the Western motif takes a backseat. Sometimes a song can be just weird, like the ode to the cowboys latest woman in Brand New Whore. It makes you wonder if parody might be one of Boothill Regulators' goals. While blending hard rock with the American West, and its music, is hardly novel, it seems the Boothill Regulators are having a good time doing it. It least they aren't as campy, country and lame as Germany's The Boss Hoss. Boothill Regulators gives you edgier hard rock stylized by American West themes and music, and they're good at it.